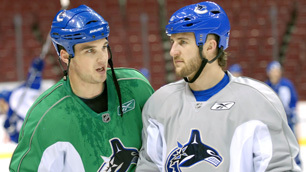 The Vancouver Canucks wasted little time getting into the thick of signing players this week as Monday morning general manager Mike Gillis announced the Canucks have inked forwards Tanner Glass and Alexandre Bolduc and defenceman Shane O’Brien. Glass, Bolduc and O'Brien were all restricted free agents so seeing them back with the Canucks isn't a huge surprise. All three are welcomed back with open arms thanks to their previous play in Vancouver. The Canucks are now down to four players on their list of restricted free agents, led by Mason Raymond. It is expected that Raymond will be back in Vancouver of the coming season based on comments Gillis made regarding the forward at the 2010 Summer Summit last week. The Canucks now have 23 players under contract for the 2010-2011 season.